No matter if you are already retired or still planning your retirement, you’re smart to think about the traps that might jeopardize your financial future. That way you can do something about it before it’s too late. Truth be told, most people I meet are anxious about their financial future anyway – at least a little. By meeting the obstacles head on you can remove those fears and that’s very important. I believe that you have the right to be excited about your present and future – no matter what. For me, that’s a line in the sand. Let’s silence the fears once and for all by knowing where the potholes are and learning how to avoid them for good. Assuming you’ve handled those two requirements, let’s examine the obstacles and how to overcome each one. Once you run some retirement projections, you’ll know more or less what kind of nest egg you need to shoot for. If it looks like you are falling short, the easiest way to pump up your retirement savings is to sock more away in your retirement plan. If you have a plan at work and they offer matching, your savings task just got a whole lot easier. According to Investors Business Daily, the average 401k contribution is 7% of salary. And the average employer matches up to 6% of your salary. I normally don’t like to compare people but I’m showing you these statistics to give you a frame of reference. 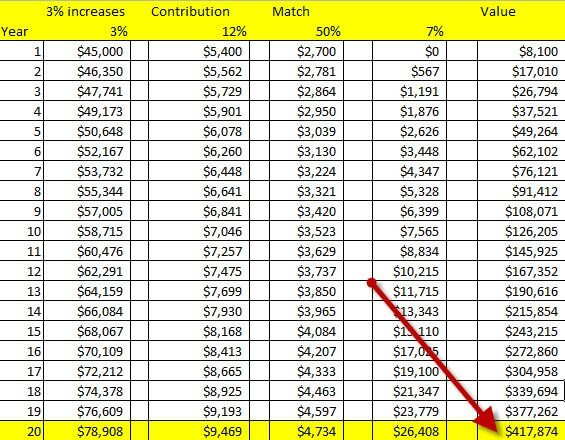 There are reasons not to contribute to a plan but most people probably should. Your accumulated savings almost doubles. 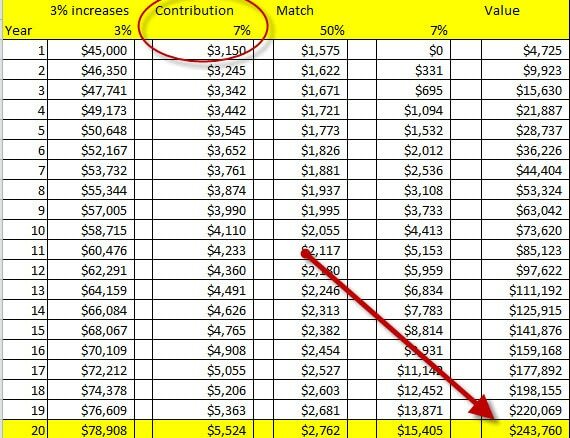 And because those contributions are all pre-tax you barely feel the income reduction. Remember, every dollar you stuff into your 401k or other retirement plan only reduces your take-home pay by about 65 cents. That’s spicy. So if you really want to secure your retirement, your first task is to put as much as you can into your retirement plan. Go the extra mile. Give up a little now so you can have a lot more down the road. Simple to say. Hard to do. I get it. But the alternative is not attractive. Let’s make it happen. No matter how much you put away, if you don’t have a handle on your spending, your retirement is in jeopardy. 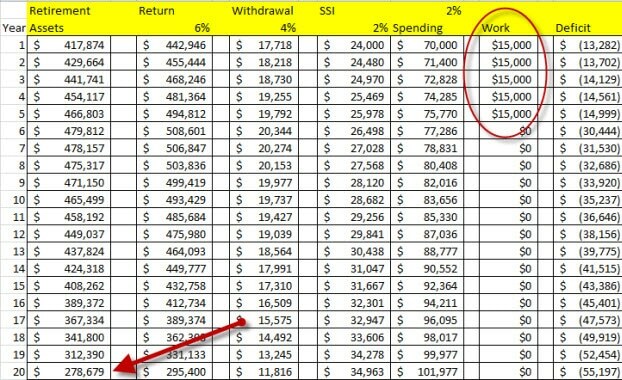 The best way to stay on top of spending is to track it. You can either use my “5 minute budget tracking system” which is free and easy or you can use a more sophisticated program like You Need A Budget….or you can do what I do which is use both. At the end of the day, it doesn’t matter. Just implement a spending tracking system. Update your tracking every month and make spending adjustments as required. Make sure you control spending rather than allowing it to control you. If you are scraping together everything you can and still can’t save enough, don’t worry about it. You can still protect your retirement with one four-letter word – work. You can work a few more years before you retire and/or work a little during retirement. Even working one extra year might be enough. Re-run your plan with these added inputs and see how the magic happens. Want to see something “way out”? Look at the table below. This shows what happens if you run a deficit. The first scenario is one in which you do nothing about it. In this case, you’ll do fine – until you are broke 17 years after you retire. That’s ugly Pilgrim. Let’s try a different set of shoes on. Scenario 2 still shows you running a deficit but a much smaller one. That’s because you work part-time for an extra 5 years. As a result, your initial deficit is smaller. And because of that, you don’t run out of money. Happy Beautiful Pilgrim! 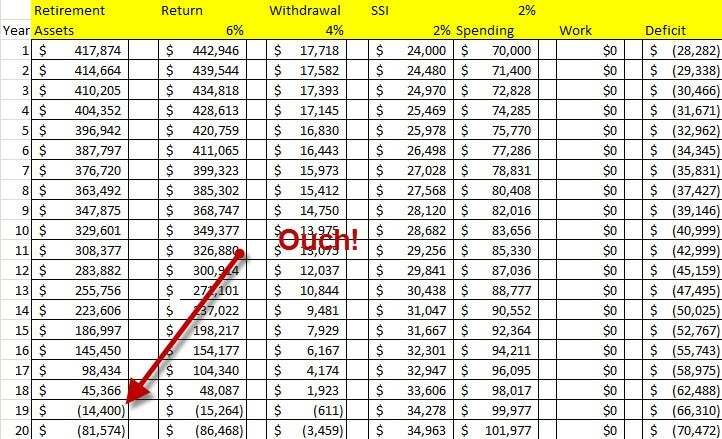 You can see that there is plenty you can do to increase retirement savings and safeguard your retirement even if you run a deficit in retirement. That’s a lot of freedom and should make you feel pretty good. I know it makes me feel toasty. But the one thing you absolutely must have is a forward-looking plan. That part is non-negotiable. The last piece of your “retirement security” puzzle is having buy-in from your spouse and an accountability partner (who may or may not be your spouse). But this is not to say your spouse isn’t important. You absolutely need your better-half on the team. You are making a commitment to your joint-future and you may have to change some of your financial behavior. It’s hard enough to get motivated to do this on your own. The last thing you want is to deal with strong push back at home. If you need help finding common ground with your better half, pick up a copy of “Money Academy For Couples”. The exercises in the book are designed to bring you two together on the same financial page. Your accountability partner is another key player on your financial success team. Discuss your plan with that person. What holes do you have in your plan? What have you overlooked? This is invaluable input that only an objective third-party can provide. You can see that once you lay out a blueprint for your future, there are a ton of things you can do reduce the risk of ever running out of money. The sooner you take action, the easier it will be to stay on track. Are you concerned about your retirement? Why? What have you done about it? What has worked best?